We offer two very good horoscope compatibility reports for you. These are computer generated reports based on the text of long time astrologers, analyzing the compatibility factors between two people over a full spectrum of life situations. 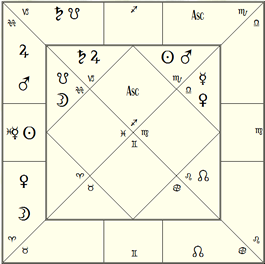 We offer a choice between a very unique Vedic astrology based report, and then a more traditional Western astrology compatibility report. The traditional method of relationship compatibility in this report is based upon the Moons of the couple and determines their fundamental compatibility. It measures the flow of the life force, or energy, between the two people, whether harmonious or inharmonious. If the matching of the Moons is adequate the couple will have the capacity to relate in a manner that allows the love to flow and for both of them to grow in a positive way. Karmic and behavioral factors will modify to which extent they will fulfill this capacity. If the matching of the Moons is inadequate the couple will find it difficult to flow together; their very life force will not harmonize well together. This is one of the most interesting reports available today. BONUS: Receive a free Vedic Relationship Chart as pictured at left. This is the more traditional Western astrology synastry report, all in plain English. This report has is very clear in it’s writing style, focusing on positive solutions for potential negative situations between two people, whether they be lovers, family, or business associates. This has been a very popular report, which has been offered at a much higher price elsewhere. BONUS: Receive a free chart synastry wheel as picture at right. Receive BOTH reports for only $8.97. Please fill out the form below to receive the report with bonus chart. When you click “submit” you’ll be automatically redirected to a Paypal payment page. Upon receipt of funds, the report will be sent as a pdf file to the email indicated in the form below. Report will be delivered within 8-12 hours.